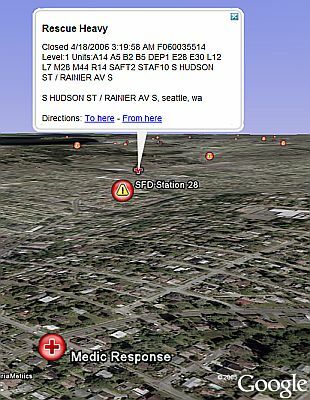 Last summer someone named 'greenwood' at the Google Earth Community posted a cool application that takes a live feed of 911 calls and generates placemarks based on an address lookup. The placemarks are classified according to types like "Aid Response", "Medic Response", etc. 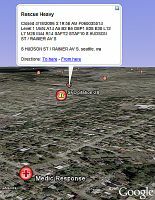 You can download the Seattle 911 network link now. If there are just a few current 911 calls, you can open the "Archive" folder and see no-longer-active calls from the last 24 hours. Since Seattle is in high resolution, you can usually see plenty of detail such as the actual house or building where the call originated. The network link automatically updates every 10 minutes. 'greenwood' also posted a nice collection of web cams for Seattle , and someone named 'Renal' recently posted a collection of placemarks showing the locations of Seattle Fire Departments . I have a serious ethical problem with this one. Just because the technology lets us, how far do we want to go down the path of turning peoples' real misfortunes and distress into our casual entertainment? Think about if you had to call the ambulance or the police: would you like to think that a bunch of Google Earth enthusiasts are voyeuristically observing you as much as they can? This isn't any different in having a radio scanner on the police and fire/rescue freqs. it is different in scale and execution, granted. I have privacy concerns with this. Why should it be the public's business regarding who is requesting emergency assistance? For a somewhat reasonable comparison of scale, consider file-sharing. Having a scanner in the area is comparable to someone copying a cd and sharing it physically with friends. The GE implementation takes it to the Napster/(Pick your favorite protocol) level, allowing anyone with a computer to track people and their activities. I imagine it won't take long for ambulance-chasing personal-injury lawyers to use this to try to increase their business. "I have privacy concerns with this. Why should it be the public's business regarding who is requesting emergency assistance?" Who cares if someone sees that you need assistance? Do you think all "Google Earth enthusiasts" are going to know who you are? Granted you have good point on the ambulance chasing but thats happening all the time too. As far as the question of how far are we going to go...All the way! For the record, the data feed used to collect the 911 information was modified, causing this plugin to no longer function (the source was changed from a text-based listing of incidents into a screenshot/jpg).